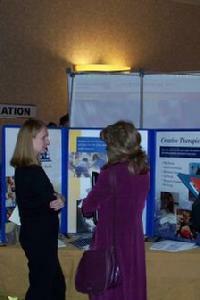 Research the companies you are interested in approaching at a career fair and get inside information by asking for it. Engage the recruiter in professional dialogue so that you are memorable. Nothing can take the place of face-to-face conversation. Ask questions about the online application and what would help your application stand out from others. Take notes. Find out what “key words” you should use in your online application. Remember that the same rules still apply with online applications. Your application materials must be well organized and error free. Enter data in the correct fields and complete all fields or assessments, even if they are not required. Use the “comments” section to highlight items left off your resume. Be sure your resume will upload or convert electronically while maintaining the format – bullets, bolding, underlining. Ask the recruiter how, when, and who you should follow up with.